Simplify the hosting experience and serve in trendy disposable plates without compromising on design, heft, and comfort. Wave shape and twist accents add style to dinner parties, holiday meals, baby showers, wedding rehearsals, and more. Theses plates are heavyweight and durable enough to be washed and reused for more usage, or handle as disposable and toss after the party. Set in plastic to enjoy the convenience of disposable and the look of glass. SET IN STYLE YOUR NEXT EVENT!!!! With its characteristic waved shape and curved accents, WAVEWARE is modern dinnerware at its finest. Perfectly raises the bar for upscale dining like weddings, parties, birthdays, holidays, corporate and formal affairs. SOPHISTICATED DINING IN CHINA-LIKE DINNERWARE: The heavy plastic construction will have you convinced you are looking at fine china, but the price will tell you otherwise. These soup bowl plates are ready to impress any crowd, so start inviting! DINE LIKE A QUEEN + LEAVE IN ROYALTY = ENJOY THE EFFORTLESS CLEANUP: Disposable Works!!!! Leave the party together with your guests. Toss 'em in for easy clean up, Or reuse them for your next event. Host like a PRO!!!! WHATS IN THE BOX?? 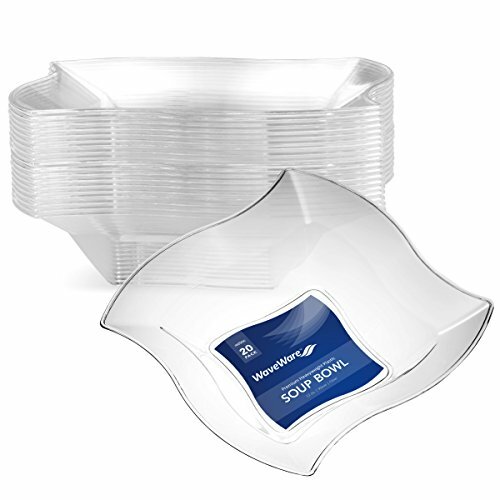 WAVEWARE Collection heavyweight -CLEAR- Square New Wave 12-oz soup bowl plates 20 count. The extra wide rim on the sides of the plate will frame your dish into the most beautiful platter at your fine event. DISPOSABLE DINNERWARE NEVER LOOKED THIS GOOD!!!!! JUST CLICK ADD TO CART NOW!!!!! Elite Selection Set Of 40 Party Plastic Plates Gold Rim Includes 20 Dinner Plates 10.25" And 20 Salad/Dessert Plates 7.5"